The knight who says "ni"
Deadline’s coming up, eagerly awaiting the verdict on this one. Also, bump for anyone else who wants to throw their hat in the ring; the more the merrier. Well, my application is mostly complete, two posts up from this one. I'll get Cadogan and Drake's chat up sometime tomorrow. Good luck to everyone! Last-minute edits. Hope it reads alright. Thanks for the consideration. I'll go ahead and close out the application process and start reviewing for acceptance. Announcement to come Monday. My application's status didn't change in the table but it's still being considered, yeah? Thank you all for the applications. PM's have been sent to the successful applicants. Open for new Applications Looking for two new party members to help fill the group back out. Here is a link to the current game thread. The group has already escaped the clutches of the Bronzemantle brothers and is making their way toward the Evenwold and a faerie road that leads to a halfling burial barrow. Supposedly along this road is an ancient druid who has permanently taken on a tree form. They are being hunted by some evil creature out of the Fae and are being aided by a hunter named Bhanel who once belonged to a cult known as the Greensleeves. They hope the druid can tell them how to close the portal to the Fae that the Greensleeves have opened. The group currently has a monk, druid. We have a bard, sorcerer and paladin who are being NPC'ed at current but their involvement could change. Race: Half-Elf – The elves of Taeth Aresti far to the northeast are still at odds with the humans of Rhyfel. Unions between the two are rare and many will find neither culture will welcome them. Half-Orc – The orcish hordes that used to inhabit this land retreated across the southern mountains a thousand years ago where they still dwell in scattered, leaderless clans. Unions between orc and human are rare but there is a small population with orc blood in their lineage who dwell in the Empty Hills, unwelcome in the rest of Rhyfel. Dwarf – Hundreds of years ago, the dwarves who dwelt in mountain kingdoms in the surrounding mountains, fled their ancestral homes. They spoke little of the reasons but were mostly welcomed into human lands as smiths, miners, and brewers. Some fell into drunkenness and debauchery, lamenting their lost heritage. Few still live who fled those kingdoms. You are a child or grandchild of a broken parent come to the Empty Hills to forget past pain. 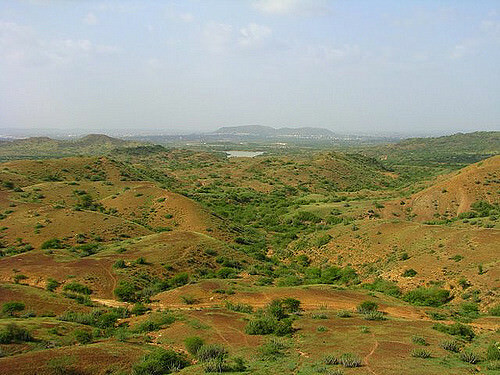 Human – No one wants to live in the Empty Hills. You’re either born here or you have nowhere else to run. Halfling – The halflings have a perfectly wonderful settlement on the far eastern border of Rhyfel nestled up against the mountains. Only a halfling would leave that for the adventure of the Empty Hills. If you'd like to try something else, just ask and maybe I can work it in. Alignment: Anything, yes even evil, this is the Empty Hills after all. But if you choose evil, you must have a redeeming quality of some kind. You may not start out a hero, but you will end up one. What about your character would grant you the ability to make this transformation? Description: A picture is great and helps a lot during the game. Also, please describe at least one article or possession of your character's. What is it, how did they come across it and why is it special to them? Personality: You can use what's provided in the backgrounds or come up with something of your own. Backstory: The Empty Hills are a rugged and somewhat lawless place. Why is your character here? Most likely, you will encounter the group in the wilds. Why are you so far from any towns or settlements? Come up with a character concept and I can help fit it in. More Info Here is some info copied from the first post about the Kingdom of Rhyfel and the main goddes, Evelyn. If you would like any further clarifications on anything, just ask! We'll be starting at level 1. Osonia is a beautiful half-elven woman in her early twenties. She stands at the height of 5'8", and has smooth dark skin. The half-elf's hair has been grown long and dreaded into elegant strands which she braids down her back. Osonia's eyes are a soft hazel and bear the slight almond shape hinting at her elven heritage. Of course there is no hiding her long pointed ears, in which she wears simple golden earrings. The Wizard dresses in earthen tones, favoring greens and yellows. 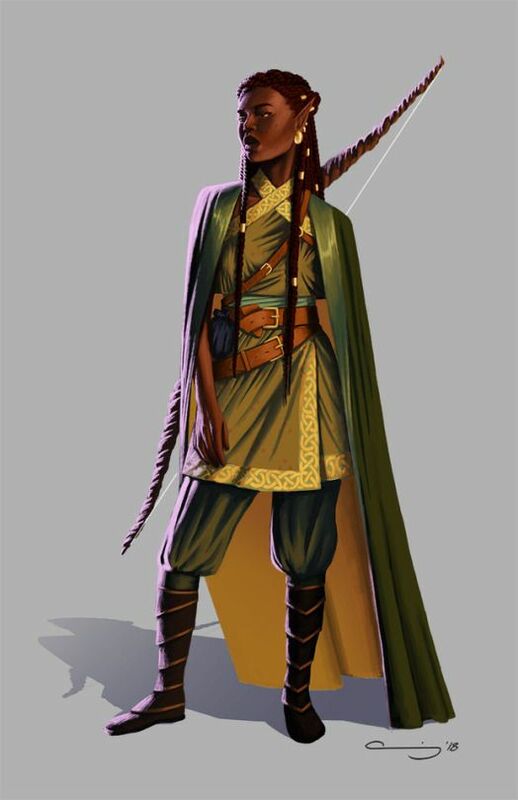 A staple to her wardrobe is a thick leather belt from which she hangs a dagger, a small components pouch, a quiver of arrows, and a spellbook. Then slung over her shoulder is her prized possession; A longbow made of a single twisted piece of darkwood that was made in Areth Taesi by her father. Carved along it's twisted ridges is a poem written in Elvish, as a last goodbye to her. Personality: Osonia's default state is distant apprehension, having never really fit in wherever she has traveled. Though, once she has rather obviously made up her mind that the person she's talking with is actually being friendly towards her, she in turn shows a shy, if not friendly side to herself. A fan of clever wordplay and and witty retorts, the half-elf isn't so hard to get along with. When conflict arises she again hides behind her mental walls and becomes coldly calculating. Osonia gets a little rattled if she didn't have the proper time to plan a strategy! In fact she's a little offended when the plan is no plan, and winging gives her anxiety. Backstory: Her father was an elf of Areth Taesi and her mother a human. The two of them met secretly and began a relationship, damning the taboos. Eventually, Osonia was born, and her father took her back to Areth Taesi to raise her as an elf. Due to her more elven features, the young Osonia had no issues living her life under the assumption she was a full elf. It was there she learned of magic and the use of their ancestral weapons. Osonia seemed to be fully integrating... That was until her mother came back, hoping to see her daughter. The drama that ensued afterwards was tragic, and ultimately ended in a dead human, an ashamed and disgraced father, and Osonia exiled as a half-breed. Osonia has traveled the wilds of the Empty Hills since as an Outlander, with scarce little sense of direction. As someone playing in one of the other Priestess groups, I cannot recommend this game enough. It's crazy good, and you'd be crazy not to apply. I'm a second player in yet another of the Priestess groups, and I'm wholeheartedly with Starflier: This game is mysterious and interesting with many moving parts and always something that seems to be going wrong (which means the game is always going right). Last edited by Numen Wraith; 02-11-2019 at 03:49 AM. Reason: What's this? Interest is evolving! Sorry, I'm going to withdraw I'll definitely be reading though! Last edited by DaysUntold; 02-12-2019 at 07:55 AM. We've filled all the spots we need for now. Thanks for the interest!